Beaumont is the United Kingdom’s foremost designer and manufacturer of high efficiency direct fired water heaters. These products can be installed in all commercial and industrial premises requiring large and/or economical hot water systems. Beaumont is a name you can trust and one that has been built up over 45 years. 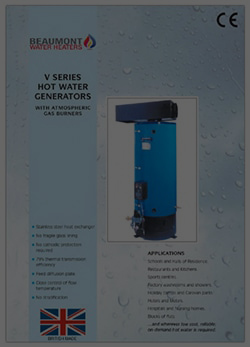 We build, design and manufacture water heaters to the highest standard, reliability and efficiency. In turn, this keeps maintenance and servicing costs to a minimum. Beaumont has supplied boilers that are still working after thirty years. Our water heaters last longer and are more reliable than most others. This keeps down the cost of servicing and maintenance. We have boilers that are still working after 30 years. Beaumont have been designing, manufacturing, installing and maintaining hot water heaters since 1966. Our boilers have been installed in various premises from; hospitals, hotels and palaces to government buildings and military barracks. Beaumont is committed to staying at the forefront of water heater design and technology, so that its boilers are more reliable and energy efficient.